← Does your Crosspool group want to take part in this year’s scarecrow competition? 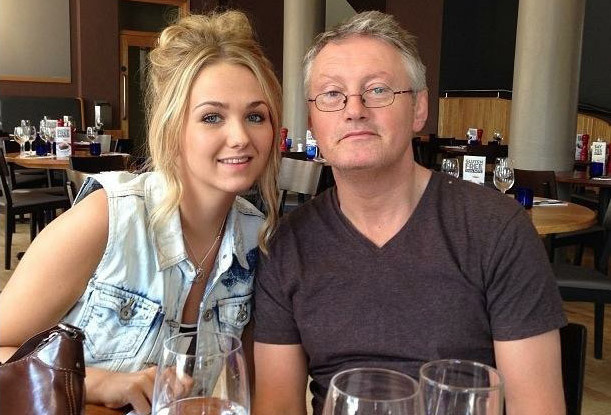 A determined daughter from Crosspool is striding out at this year’s Plusnet Yorkshire Half Marathon to remember her beloved dad who lost his battle with cancer in February. Emma Sheehan (23) will take part in the 13-mile race through the streets of Sheffield on 10 April after losing her dad to cancer just under a month ago. In a bid to raise funds for Weston Park Hospital Cancer Charity, Emma signed up to the event back in 2015, unaware that by the time the day came around, her dad would no longer be with them. After being diagnosed with bowel and peritoneal cancer in June 2015, Emma’s dad, Dave Sheehan (56) received radiotherapy and chemotherapy treatment at Weston Park Hospital, the region’s only cancer hospital. But after several infections and stays in hospital over the last few months, Emma’s family were given the devastating news that there was nothing more that could be done for Dave and he passed away at the end of February surrounded by his loving family. “It’s been an incredibly difficult few months.” said Emma, “We are all still coming to terms with the loss of my dad and the huge void he has left, particularly for me, my mum and my elder sister, Aimee. Weston Park Hospital Cancer Charity is the only dedicated charity for the hospital and exists to support the world-class cancer research and to improve the treatment and care for people living with cancer. Emma continued, “I know he’d have been so proud of me on the day when I reach the finish line and the more money I can raise beforehand will allow other families living with a cancer diagnosis to receive the support and care they so desperately need. Emma will join thousands of people taking part in the first Plusnet Yorkshire Half Marathon – Sheffield, which starts and finishes in the city centre and follows a scenic route offering outstanding views of the Peak district. The cancer charity is encouraging supporters to sign up for the event and join Team Weston Park with each runner raising vital sponsorship to support life-changing projects within Weston Park Hospital. “We would like to wish her the very best on the day and our Team Weston Park cheering squad will undoubtedly be cheering her on, loud and proud, from the sidelines. Emma has now raised over £1,800 on her JustGiving site and has further donations to add to her total after a collection for the cancer charity was organised at Dave’s funeral. This entry was posted in charity, crosspool, health and fitness and tagged crosspool, emma sheehan, half marathon. Bookmark the permalink.